Olivia's studio may be confined to a single room for now, but that doesn't stop it from teeming with life. Sketches, paintings, and completed works by herself and colleagues paper the walls. 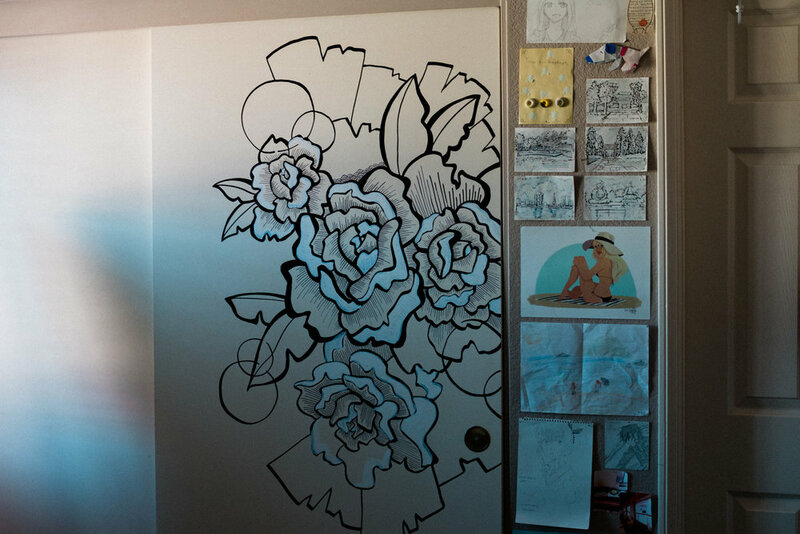 A mural in progress climbs the otherwise sterile suburban closet door. Upon graduating with a BFA in Fine Arts Painting from Otis College of Art and Design in Los Angeles, she traveled to Japan to teach English. In her current space, letters and sketches from former students are lovingly tacked to a small segment of wall, relics from an experience that is still influencing her current work, having only been back in the states since September of 2018. Olivia says her sketch process "flows from itself," and the organic nature of the pen and ink pieces work definitely reflect this. Botanics and geometric shapes form mandala-like structures through many smaller pieces. "I have to get out of the house to work. Usually I go to a coffee shop and get a giant hammerhead—that's a shot of espresso in a cup of coffee—and just doodle. I'll doodle until something clicks, then I can come back and work on it." Peonies and roses (for Japan) are recurring themes, along with sunflowers (for her grandmother). Tentacles and geometry also make appearances, mixing feminine line work with grittier, stabilizing forces, which separates Olivia's work from the other illustrative artists in her genre right now. When asked if she prefers smaller scale of sketchbooks to larger scale pieces, Olivia lights up. "I would love to do more murals. Immersive, large scale rooms. When everything's small, there's so much detail that you can't see." She shows me some photos of murals she's done. "That grid there, each box is four feet by four feet." The enormous mural depicts a feminine face surrounded by roses, emerging from a stunning backdrop of tight geometric patterns. Looking forward, Olivia is seeking to get more in to tattoo work. Many of her illustrations have been turned in to tattoos already, one of which is on her own back. The sketch given to the tattoo artist to make their own is still tacked on the wall. Her timeless style and tendency for crisp, black and white work lends itself well to the medium. A move back to Los Angeles is also on the horizon. In the meantime, Olivia makes commissions regularly and is continuing to expand her portfolio daily. I would certainly mark her down as an up-and-coming artist to watch. You can find Olivia's work at oliviaobrecht.com, or on Instagram @oliveeo.